One of my favorite apparel and footwear lines is PUMA...I love their stuff! They have great textures, colors, and build quality- especially the mens clothing. I recently bought 4 of the solid color polo shirts with contrast inner collars and matching PUMA logo and LOVE them. The material is breathable and fits great. While I love to look at their shoes- they are often too narrow for my clunky feet but occasionally they'll make a shoe in a wide width that fits well...while I would love to get some of their Ferrari special edition shoes- they're just too blasted narrow....but anyways, that's not what I'm talking about today. The line of luggage and bags they created with MINI is on the more refined side of design for PUMA. Instead of the flashy colors and bold accents you get a very clean- yet modern and stylish. 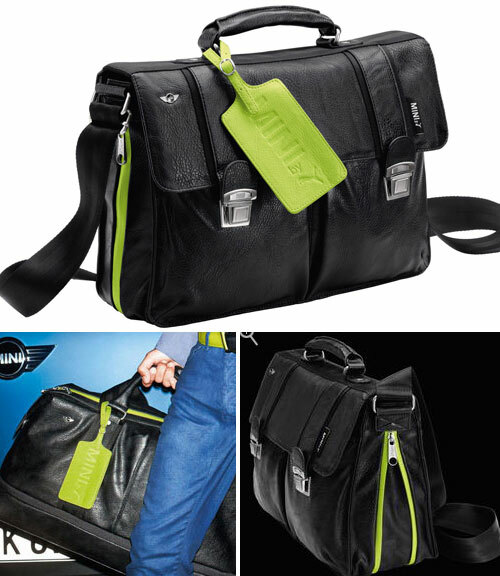 The rich black leather is soft and supple and the accent lime green color is a great match for the black. It keeps the line from looking too mainstream while maintaining a design edge. Check out the full line of PUMA special edition MINI luggage and bags and find your next bag!